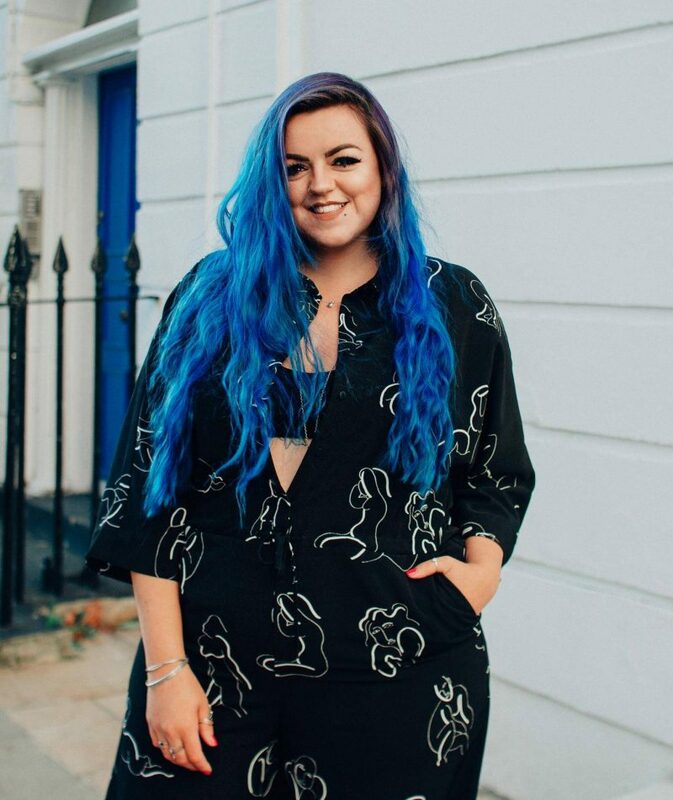 Every year, festival make-up gets bigger, better and more creative, with influencers flooding our social media feeds with incredible at-home creations that must have taken hours to perfect. 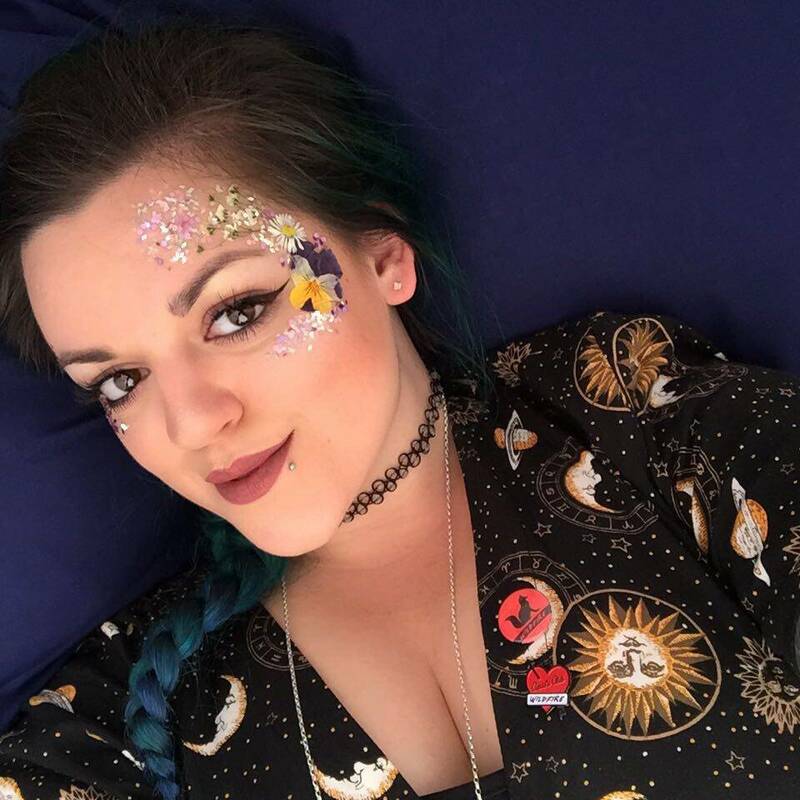 In the past I have seen some amazing make-up actually at festivals too, but for me, a lot of the make-up looks have always seemed far too complicated and time consuming to dabble in myself after waking up in a tent. 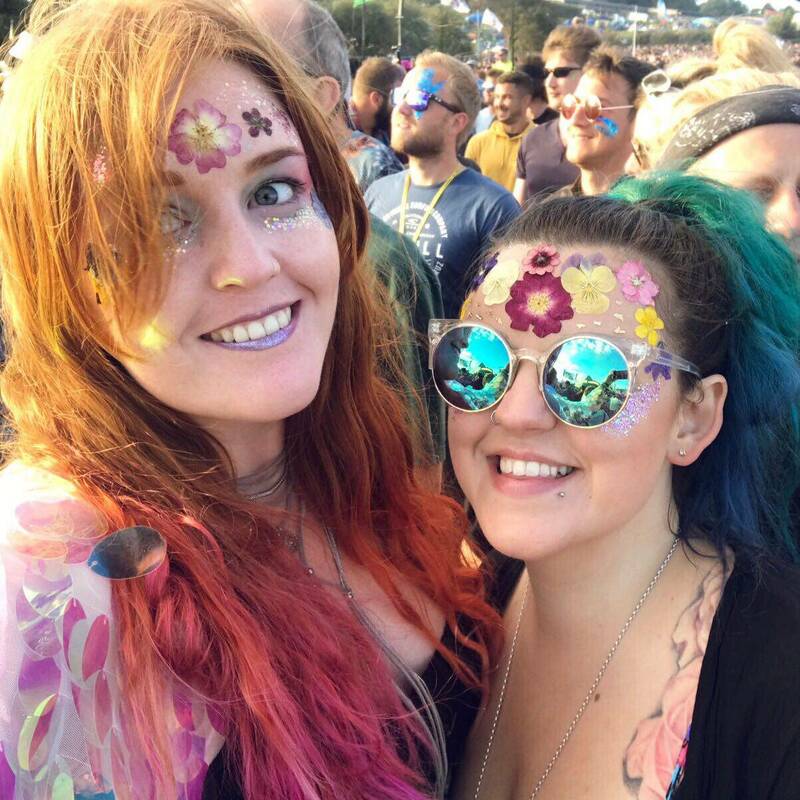 So, when I came across Face Florals (thanks to my pal Jessi who runs festival blog Where’s My Tent) – a company that sells high quality pressed flowers to put on your face, I knew I had to try them out for myself! Face Florals – what’s in the box? Before my box arrived in mid-June, they had already sent Jessi a sample box to try out. 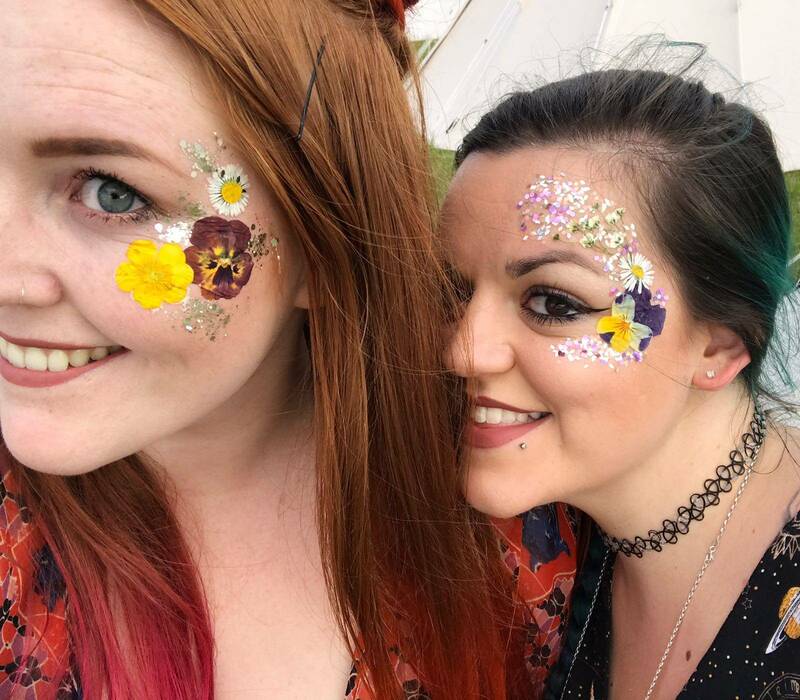 So at Camp Wildfire (an adult activity festival that I went to the week before Glasto – more on that soon), armed with an old make-up brush (for the glue) I stuck a few of the flowers to my face. I tried a pressed Pansy, Daisy and piece of Gypsophila from the box Jessi had, as you can see in the pic below. My temple/cheek bones/under eye area is usually where I put a ton of glitter, so it felt only right to add some of that amongst the flowers. This was ever so slightly more subtle and delicate than my Glastonbury entirely-covered-forehead look above, I think. One thing I will say is that if your skin is warm the glue can take a little while to try, it’s also pretty sticky and gets all over your fingers. So don’t rush it, take your time, and remember not to scratch your face in the places the flowers are stuck (rookie error)! As a company they have been nothing but lovely to speak to. Super speedy to reply when I’ve had questions or queries, and incredibly friendly. I absolutely adore their pressed flower products and the whole brand as a whole, and have been recommending them to everyone! On their website they have ‘the promise‘ – where they explain how committed they are to high quality products, as well as showing their awareness of endangered plants and reassuring customers that flowers are sourced from the right places. There are plenty of festivals left this summer and these are the perfect easy, make-up accessory to jazz up a festival look. If you prefer yu can go all out and cover your entire forehead (like I did!). You don’t need to be particularly artistic for it to look good and you will undoubtedly get lots of compliments (I certainly did!). As well as for festival make-up, I think that these would look great for photoshoots, or special events like birthday parties or perhaps even weddings! I have a feeling we’ll be seeing a lot more pressed flowers used as make-up looks this year and next. If you want to feel like a flower fairy, check out the Face Florals website! You can buy your own box from Etsy or Not On The High Street, and each box costs between £5.50-£7.50 – so it won’t break the bank! Make sure you follow Face Florals on Instagram for inspo (you can also find them on Twitter & Facebook @faceflorals)! 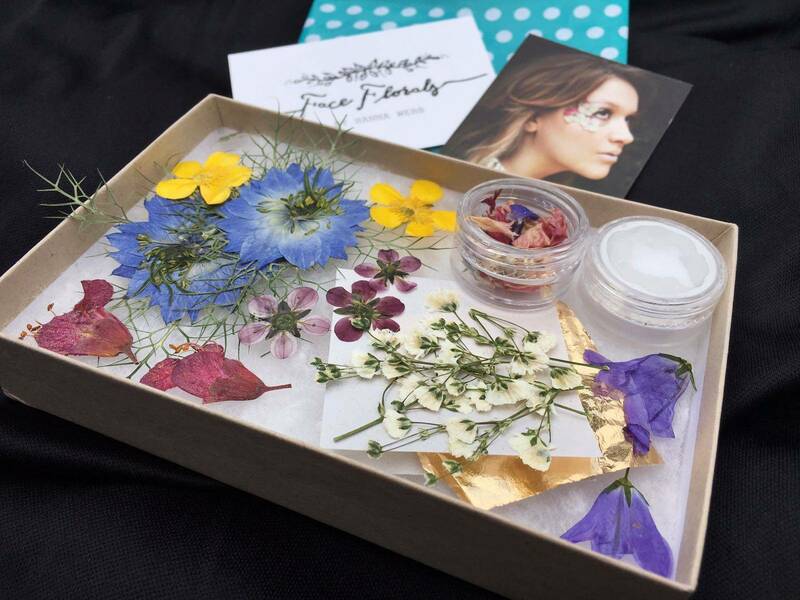 The sample box of pressed flowers from Face Florals was sent to me free of charge. This has not affected my review – which is a true reflection of how I found the products. Previous Post 2000Trees 2017 | What Can I Expect?